By Katherine J. Kahn Simple Hanukkah crafts and activities for little ones. Make dreidel decorations, read the picture-story of Hanukkah, and have fun with the full-color playing cards. By Roz Grossman A book, a tape, and a dreidel, all packed in a handy plastic tote. Learn to play the spinning game; enjoy your favorite dreidel songs on cassette; and test your skills with the sturdy, wooden dreidel. By Dandi Daley Mackall Besides playing dreidel, eating latkes, and singing songs, everyone wants a turn to hold the shamash and light the Chanukah candles. You can celebrate the holiday by decorating with the shimmery foil stickers anywhere that needs a little Chanukah warmth! Children will delight in this charming Chanukah story. The narrator eagerly awaits the start of Chanukah. As the holiday progresses, she consistently wonders, "Who'll light the Chanukah candles?". Each night, she watches her cousin Randall get the upper hand in everything from a game of dreidel to getting all the gelt (all of the narrator's gelt melts). Finally, on the last night, Randall asks the narrator to light the candles. Children will love the short sentence structure, lyrical rhymes, and shiny Chanukah stickers. Children will identify with the family rivalry between the narrator and her cousin. An excellent choice for preschoolers. By Miriam Sagasti Animals galore light the menorah and dance the horah to "remind us of days long ago." Words/music to popular folksong. Animals and children celebrate Hanukkah in this charming board book. The words to the popular song "Hanukkah, Oh Hanukkah" provide the text to the book. Illustrations are bright and engaging; children will find something new each time the story is read. The book includes sheet music to the song on the back cover. By Judith Moffatt Rhyming couplets explain the holiday in Judith Moffet's Chanukah Lights. Stories, songs, spinning dreidels and fried latkes lend a festive feel. This addition to the Night Glow board books series boasts collage illustrations with glow-in-the-dark accents. By Madeline Wikler and Judyth Saypol Groner Similar in format and scope to Matzah Meals by Judy Tabs and Barbara Steinberg, this companion volume provides recipes and games for Chanukah. Recipes are written clearly, and symbols rate each one for degree of difficulty and label each for Kashruth (meat, dairy, or pareve). Each recipe also pictorally depicts the kitchen equipment necessary. There are enough recipes for the eight days of the holiday, including easy and difficult versions for traditional "latkes" (potato pancakes) and "suf ganiyot" (donuts). Other recipes carry through the Chanukah theme, including "Candle Salad" and "menorah sandwich." Directions for cutting and ar ranging a plain sheet cake into either a menorah or a dreidel shape are clear and clever. Directions for playing drei del and other appropriate games are included. This is a lively, entertaining book that will fill a need where practical celebratory information on this holiday is needed. The plot is well devised and recounted with verve, and Carmi's illustrations, with their subdued colors and broad, visible brush strokes, effectively evoke a hardscrabble, Eastern European atmosphere, ripe for wondrous things to occur. Tante Golda's latke recipe rounds things out. By Jane Bearman The numbers 1 through 8 introduce various facts about the feast of Chanukah. By Harriet Ziefert Why do we light the menorah? What do the letters on the dreidel mean? Josh learns about the miracles that happened a long time ago, and how the traditions of Hanukkah are continued today. The lift-the-flap format makes this introduction to a special holiday accessible to the youngest child. For young children who wonder about this holiday, there's Ziefert's What is Hanukkah? As Josh's mother prepares for the first night of Hanukkah, he questions what the holiday means. There follows a very clear explanation by his parents and the illustrations and objects behind the flaps help with the telling. Some of the book's flaps open to reveal history, the rest show holiday he fun-dreidel, latkes and gelt. The book's warm cartooning places a mix of fun and religion in a family context. By Alan Benjamin A toddler's introduction to the holiday includes all its highlights -- from dreidel to latkes to the menorah. A delightful new holiday board book in the popular chubby format -- bright, sturdy, and sized just right for little hands. By Sarah Hartt-Snowbell Annie can't believe her eyes! The "Santa" in the mall looks so much like her grandfather's friend, Simon. A Jewish Santa? Annie lines up to get a closer look�and ends up "placing an order". Simon Greenbaum, flat broke, has taken the job at the Winter Castle to earn a few dollars between jobs, he tells her. And after all, with his long white beard, he looks just like Santa already. "Don't breathe a word to your Zaideh that you saw me here," he says. "If you don't tell him that I'm a Santa Claus, I won't tell him what you asked for. It's a deal?" When Annie's parents find out, however, that she has placed an order with Santa for a Christmas tree, they are disappointed and tell Annie that she must learn to be her own person and stand up for her own beliefs in order to earn the respect of others. Meanwhile, Annie wants to help Mr. Greenbaum and comes up with a plan. But to carry out her plan, she must reveal his secret. What will she do? At the Chanukah meal that evening, Annie explains to her cousins that Mr. Greenbaum is out of work, and the children all agree to give him their Chanukah gelt, which they have just received. When Annie returns to the mall with the money the next day, she finds that Simon Greenbaum has been fired from his job for not being able to name Santa's reindeer, but, in what seems to be a miracle to Simon, he is given a job in Menswear instead. He is so happy that in an exchange of Chanukah gifts, Simon gives Annie some gelt and she gives him what she has collected. This delightful picture book, illustrated beautifully by Patty Gallinger, is a story of acceptance, religious freedom and the act of giving (tzedakah). By combining the festivities of two holidays, Hartt-Snowbell teaches us a lesson in tolerance and charity which should appeal to any child six and up. By Cathy Goldberg Fishman With the voice of a young girl participating in the nightly rituals of Hanukkah, Cathy Goldberg Fishman introduces children to the history and beliefs behind this eight-day Jewish celebration. Starting with the first night of Hanukkah she lights a menorah candle with the "helper candle called the shammash." When her mother speaks of the Assyrian soldiers who captured the Jews' Holy Temple and put out the eternal light of the menorah, the young girl thinks of the Jewish people "who fought for many years to rededicate the temple and bring the light back." Later, while playing dreidel on the seventh night, the girl's grandfather tells the story of Jews not being allowed to "celebrate our religion or read our holy books. Jews who did not want the light of our knowledge lost would still get together and study. They played the game of dreidel to disguise what they were doing." And so the family puts the menorahs in a window to be "a light of knowledge in the darkness." Melanie W. Hall's soft and slightly abstract illustrations spotlight specific symbols of Hanukkah, such as potato latkes or chocolate gelt, while offering festive spreads of family cheer and togetherness. This is teaching at its best: giving children a familiar and beautifully illustrated context for absorbing complicated ideas such as symbolism, persecution, and the joy that comes from religious freedom. A young girl describes what she sees, hears, and smells as her family celebrates Hanukkah. In keeping with the themes of the holiday, the narrator always relates what she observes to the light in the Temple during the time of the Maccabees. Soft illustrations further demonstrate the warmth associated with the holiday. 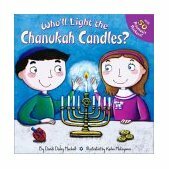 An excellent choice for preschoolers who are beginning to understand the nuances of Hanukkah.